Looking for a quick stopover before heading into the park or even basecamp while you explore the park? Come set up camp at our West Gate location. Facilities include fire pits, picnic tables, potable water as well as clean toilet facilities. Tents only please, no recreational vehicles permitted. COST: $10 per person per night. Kids 12 and under FREE. Conveniently located beside Algonquin Provincial Parks West Gate, Algonquin Bound Inn is here to provide you with the upmost comfort and accessibility to begin your adventure through Algonquin Park. Our quaint Inn is situated a great distance from any neighbours, other than the wildlife, offering the most privacy you can get in this popular park, and the delightful nearby lake makes for a perfect retreat in the woods. As the last stop right before the parks West Gate entrance, Algonquin Bound Inn features a quiet place to rest, after a day full of paddling, hiking, fishing and exploring Algonquin Park. For a stay just as impressive as the park itself, welcome to Algonquin Bound Inn. 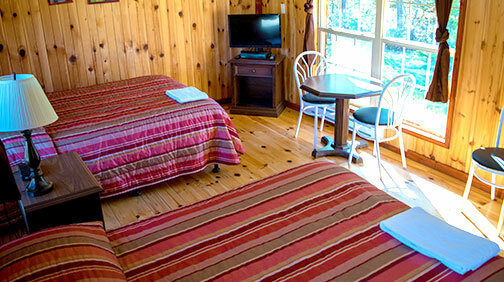 Cozy, lakeview rooms, featuring accessibility to our private lake, they are truly a room built for a Queen. Featuring authentic pine walls and flooring, refreshing air conditioning, satellite TV, mini-bar fridges, coffee makers and modern bathrooms. For your convenience, parking is located right out front and it’s only a quick walk to the nearby lake and fire pit. Sleeps up to 2 people. 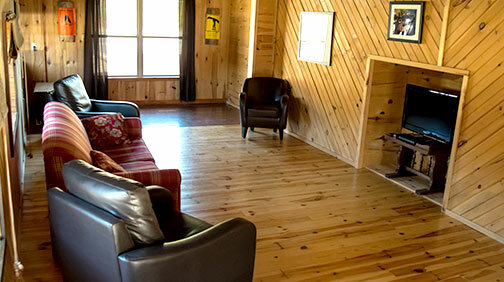 Queen RoomRESERVE YOUR ALGONQUIN PARK LODGING TODAY! With two comfy double beds, and a stunning view of the lake, our Algonquin Bound Double Rooms are perfect for any family or group of friends exploring Algonquin Park together. Beautiful pine wood lines the floor and walls, and each room comes equipped with air-conditioning, satellite TV, a mini-bar fridge, coffee makers and immaculate private bathrooms. Just a short walk to the beautiful lake and fire pit. Sleeps up to 4 people. 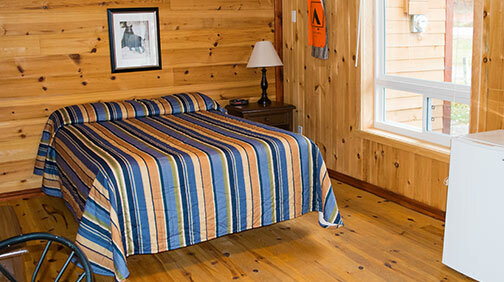 Double RoomRESERVE YOUR ALGONQUIN PARK LODGING TODAY! Located inside an impressive pine log building, our Algonquin Bound Suite offers two bedrooms, two bathrooms and a spacious living room, for the most luxurious retreat. Featuring a king, queen, and double bed, the suite also has a pull-out sofa bed for maximum capacity. With a beautiful kitchenette, equipped with a microwave, toaster oven, etc. the suite also has a barbeque area so you can enjoy your meal in the beautiful outdoors while taking in the view of the pristine lake. Sleeps up to 6 people. Algonquin Bound SuiteRESERVE YOUR ALGONQUIN PARK LODGING TODAY!